Miles was a brilliant —and temperamental—officer who received the Medal of Honor for his gallantry at Chancellorsville during the Civil War and went on to become an important commander in the Indian Wars. He was in overall command during the infamous Massacre at Wounded Knee (December 29, 1890)—which he condemned—and it was he who accepted the final surrender of the Sioux, thereby ending the era of the Indian Wars. 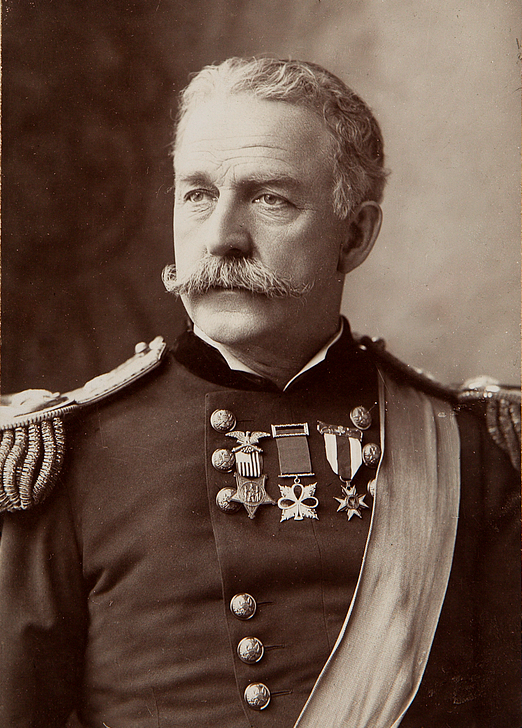 Miles fought in the Spanish-American War—he was, at the time, commanding general of the U.S. Army— and led the invasion of Puerto Rico, then served as the first head of the military government of that island after the war. He retired from the army in 1903, but, when he was in his late seventies, asked to serve in World War I. President Woodrow Wilson turned him down.